Your rowing lesson finishes at this historic boatyard for a fascinating guided visit followed by typical refreshments of cichetti and light sfuso wine. Perfect for larger groups or discriminating travelers looking for something authentic, immersive and out of the ordinary. Your rowing instructors will drop you off at the entrance of the 500-year-old Squero Casal dei Servi, that was until the 1920s a working boatyard, now housing an extraordinary collection of traditional boat artifacts and boats. 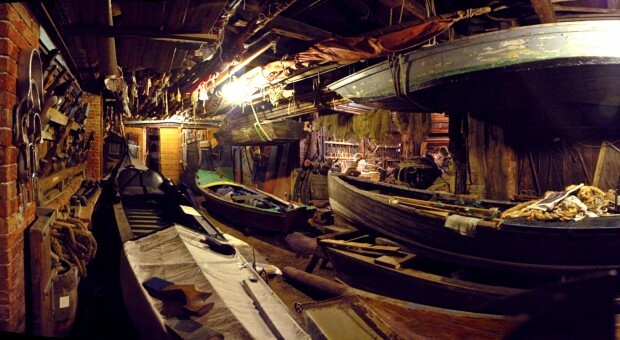 We’ll conduct a 40 minute tour of this one-of-a-kind collection of original traditional Venetian boat artifacts, from felze gondola covers, to boat building tools and implements, to forcola oarlocks and oars, to fishing and sailing rigging, tillers, rudders, boats and boat models, and much more. And per finire in bellezza, finish your outing in true Venetian style, a ‘cichettata’ or generous selection of traditional finger foods and light ‘sfuso’ wine (non-alcoholic drinks also provided); we guarantee both the wine and cichetti taste even better when enjoyed in this authentic, evocative atmosphere. Lesson, boatyard tour and refreshments will last 2 hours 30 minutes in all. Cost is €80 per person for a group of 6 or more. Otherwise, the minimum cost is €480. Write us first to request a date and time for your outing. If you do not have an account, create one (required). Book a single boat for 2 people at the agreed upon date and time. This hold your reservation and allow you to defer payment. We will manually add the Squero Tour to your reservation, adjust it for the correct number of people and cost. You may then return to your booking and pay; or we can charge the credit card on file in your account.